Dimensions 0.75 by 8 by 9.25 in. Amazon.com description: Product Description: Materials are like words. The richer your design vocabulary, the more distinctive the design solutions you can express. Sketching ideas with a pencil or rendering them with computer software are useful experiences, but there is no substitute for confronting physical forms and materials directly. 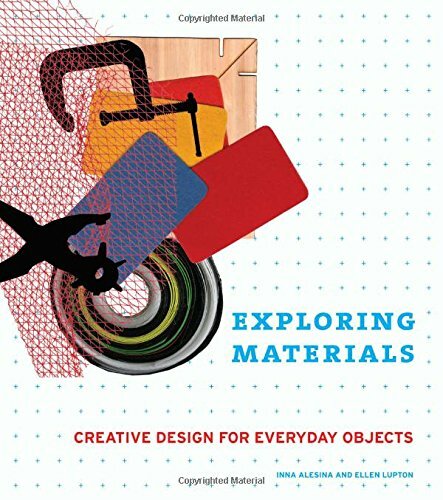 Exploring Materials is an action-oriented, accessible guide to design thinking that addresses both the "how" and "why" of product design. In place of the abstraction of pure forms or the whimsy of virtual objects, it encourages designers to make and test real objects in a studio environment. Best-selling author Ellen Lupton (Thinking with Type) and her colleague Inna Alesina examine materials from several points of view, including traditional uses, experimental uses, techniques and directions for prototyping with everyday objects, and environmental implications. Student exercises and inspiring examples from the world of contemporary product design show readers how to use materials as tools for thinking and making. The book opens with two extensive studies: one for a place for sitting and one for a method for carrying. By considering what is needed instead of what specific product can be made, designers examine the methodology of designing. The core of the book is a visual glossary of thirty-two materialsfrom corrugated cardboard to molded felt to plastic film. It highlights the materials' behaviors and propertieswhich suggest different types of structure, surface, and connectionand it shows experimental uses of these materials, demonstrating how designers from around the world have exploited their characteristics in inventive ways. The book concludes with a section on making it real, moving beyond the prototype to create a product that can be manufactured and marketed. Exploring Materials contains everything designers need not only to jump-start their design process, but also to follow a project through from idea to prototype to finished object. About: Materials are like words.